Yesterday morning as I ate breakfast I read this fun runner's version of "would you rather?" from Ruthie of She's Wicked Healthy and decided to share my answers today! Also, I emailed the winners of my Delta Labs Green + sample giveaway, and they are displayed on the widget. Thanks everyone for entering! Remember you can always use the code BREATHEBLOG for $5 off any Delta Labs order here. 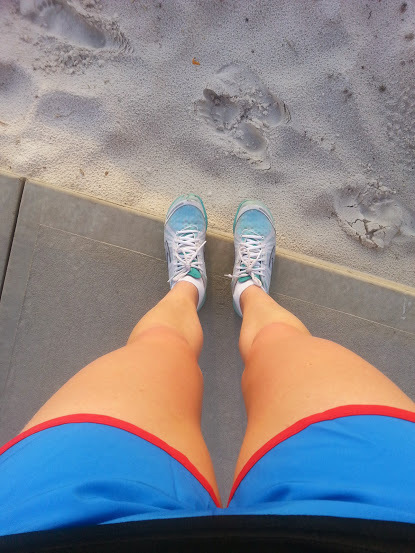 The other day Smith of Running with SD Mom posted that she finally took the plunge and signed up for her first marathon after receiving advice from fellow running bloggers-check out here what I told her! Tough one, but I'd rather run a 5K. So much time and training goes into a marathon, which is worth it, but 5Ks can be so fun and are less stressful. I can usually convince more friends to run 5Ks with me too! Is flat and cold an option, haha? I suppose I'd choose hilly race in the cold. Really hot races become uncomfortable and hard really fast, even though I prefer warm weather any other time besides running. New running shoes for sure. This girl loves shoes. 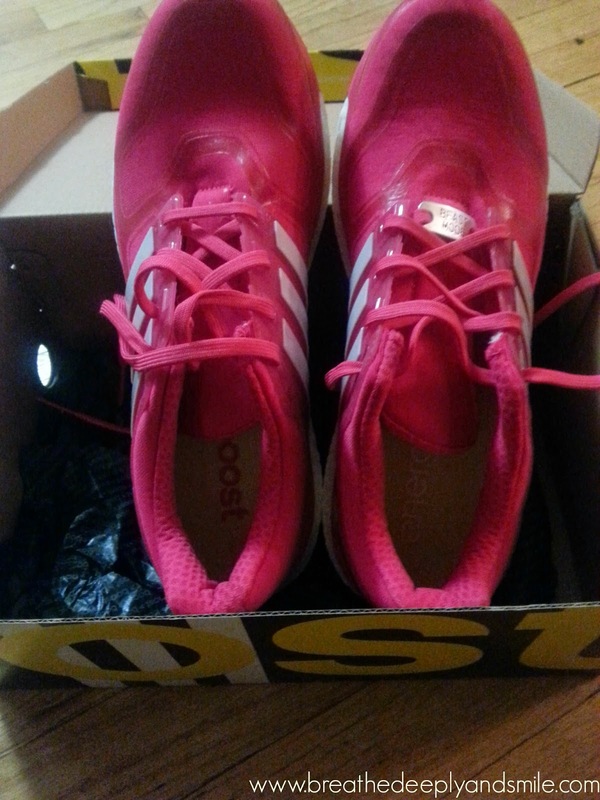 My current training shoes (Adidas Energy Boost 2)- I love how bright pink they are! Hello all, Happy Wednesday! It feels especially great today, even though it's raining here, because tomorrow is a holiday! Anyways here's a little update on my marathon training. Tuesday was a speedwork session where we ran a 2 mile time trial to help us find our marathon goal pace using the McMillan Calculator where I found out I was in the second fastest group of people-go me! I did crossfit twice during the week and then got in another strength and HIIT session on Friday. Saturday is long run day and a group of us roughly around the same pace ran a nice route from McHenry Row up Charles Street to around JHU and back down St. Paul. The weather wasn't too hot, just really humid. It has been really nice getting miles in with a group of people to keep up with and talk to so I definitely think I'm committing to the training group. 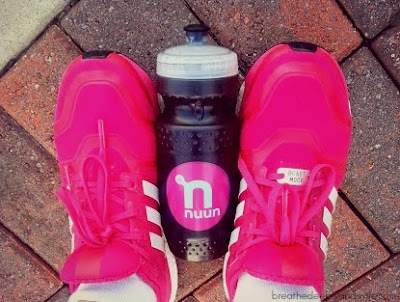 I bought a hot pink hydration belt from Marshalls and have been filling that up with Nuun for my long runs. I definitely need to drink more water on Fridays though in preparation, especially as we start to build miles. Sunday I got in a slow 5K for a recovery run after a day of eating all that boardwalk food. I definitely need to work on stretching and foam rolling more, especially with cross-training. A fellow Sweat Pink Ambassador, Sara from She cooks, She crafts, She Runs is having a Fitness Survey Linkup here today so I thought I'd join in the fun! Breakfast is the best! Today I was in a rush so I had an egg over easy, an orange, and a slice of Ezekiel raisin bread with PB&J and half a banana. I also snacked on a handful of Barbara's cinnamon puffins while I was cooking my egg. Today I have a fun post to share! Kristina over at "http://kristinamasten.com" nominated me for a Liebster Award! The Liebster award is an "award" given to up and coming smaller bloggers or to someone who deserves recognition for their blogging. Apparently, Liebster is a German word meaning dearest. I don't know what the exact rules are, but it's a great way to discover new blogs and recognize blogs that you think are awesome! 1. What is your favorite relaxing activity? I love spending a night in cooking a nice meal or baking something and then watching a movie with a class of wine in some comfy clothes. I also really like taking a long hot shower and painting my nails. 2. If you have one, what is your favorite go-to workout when you are stressed? Running, hands down. Running is like therapy! 3. Favorite brand of coffee? I love lots of different coffee such as Kona, Starbucks, Zeke's local but lately I've been addicted to the Dunkin Donuts coconut flavored coffee I picked up at Target! YUM! 4. What are your pet’s names? I currently don't have any pets but my family has 4 cats named Ginger, Oreo, Audrey, and Lucy. I've only been blogging since October and am still getting the hang out it. Hopefully there is somebody out there who likes it! 6. What is your favorite recipe to make at home? I love baking especially fancy cupcakes and banana nut muffins. Food-wise, I think I make a pretty great chili in the slow cooker and love that dinner is ready when I get home from work! 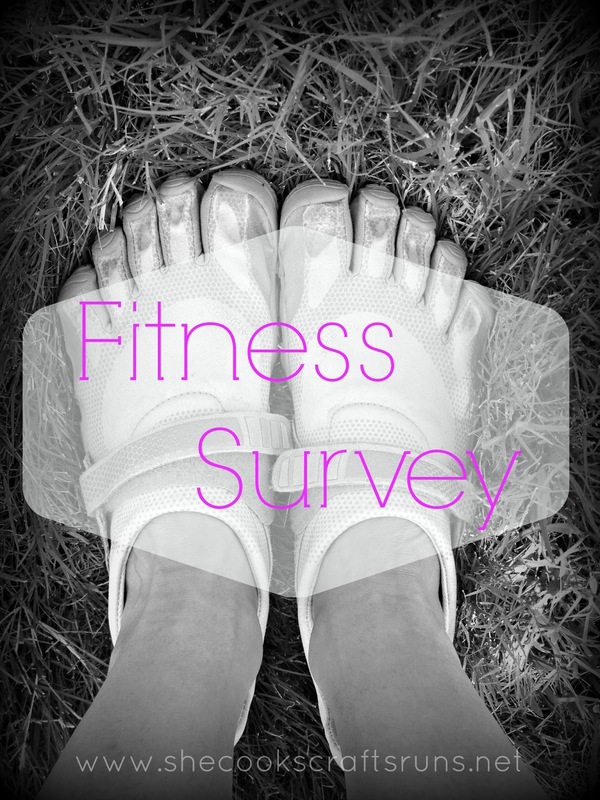 It's Monday and I'm still working on my St. Patty's Day half marathon recap so you are getting a survey post that was fun for me to fill out! 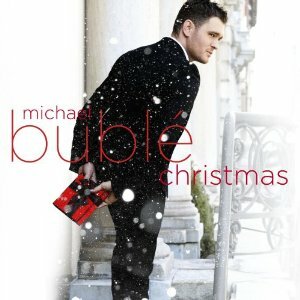 I found this one over on Adrienne's blog who found it on Mindy's blog ,and thought I’d share it with you. I enjoy a lot of treats in moderation, but I'm very conscious of my health and choices so that's what counts in my book! I always aim for 96 oz but usually only make it to 64 oz. I'm trying to get better about it. Having a 32 oz Nalgene bottle helps because I only need to drink a couple of those bad boys to reach my goal. Running because lately I've needed it at stress relief, and I can go for a run whenever I want. I'm going to try to get back into hot yoga when I can scrounge together some money because that's relaxing.